The most vilified young man from last week's riots apologizes. Says he got caught up in "mob mentality." Hate mail gets worse. Family leaves town. Sports Extra news on Boston TV discussing upcoming game. Luongo called insecure and the team quitters by sports broadcasters. Lots of trash talking by local sports experts. After an 8-1 thumping Monday night, the party around Vancouver feels like it's been crashed. 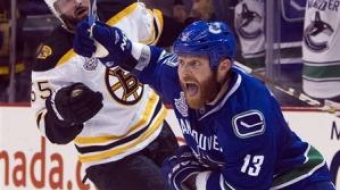 Here are four reasons why the Canucks are still in good shape heading into game 4.